Piaggio Vehicles, the Indian arm of the Italian auto major Piaggio group, which rolled out its 2.5 millionth small commercial vehicles in August, plans to invest over Rs 100 crore to develop new vehicles, new engine technology and aggressive network expansion to fuel growth in India. 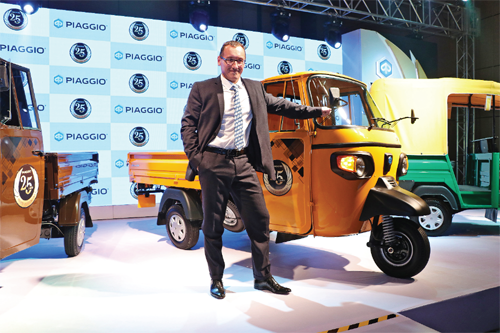 “The pillars on which we plan to build our next phase of growth in India will be investment in powertrain technology, and product innovation in order to take on competition in the country,” Diego Graffi, managing director and chief executive officer at Piaggio Vehicles told Financial Chronicle. He said Piaggio brand was a profitable company, and to fuel the growth in the Indian market was important for it. The company, he said was going to invest over Rs 100 crore over the next five years in developing new powertrains, products, including electric vehicles for the Indian market. So, this would involve focus on diesel, alternate fuel and definitely electric. “Developments on the light commercial electric vehicle front are ongoing. The electric vehicle, we expect, will come into play over the next five to 10 years in India. We are making our own roadmap for developing electric vehicles,” Graffi pointed out. The company is also aggressively working to improve its market presence in the country. Its dealership network of over 400 outlets and about 1,000 touch points is already one of the largest in the three-wheeler segment industry. “We plan to further penetrate intro markets where our presence so far is low,” Graffi said. Diesel vehicles comprise about 85 per cent of the overall production and sales of Piaggio brand in the country. “Going forward we expect this percentage to change and alternate fuel vehicles will see increased presence in the near future,” Graffi pointed out. He said the company was working closely with Greaves Cotton, from which it sources diesel engines, on the engine for providing better payloads, fuel efficiency, and overall performance to the owners of our vehicles. “We will surely meet the BS VI norms much in advance that the due date,” Graffi said. The Bharat Stage VI fuel emission norm which will kick in from April 1, 2020 and real driving emissions or RDE in 2023 are set to bring about drastic changes to the powertrain technologies at present deployed in the three-wheeler or small commercial vehicles and light commercial vehicles segment in the country. While making small BS VI diesel engines will become expensive enough that it might lose its business case for the price-sensitive market like India, the company is already readying plans to balance its portfolio with alternate fuels in the future, including CNG, LPG and even electric to be able to steer through the future challenges. According to Graffi, its first move would be to achieve total cumulative sales of 3.5 million units of light commercial vehicles, followed by 5 million units in less than 10 years from now. This will of course depend on the evolution of the three-wheeler industry in the country. At present, the brand’s factory at Baramati in Maharashtra has an installed capacity to produce 3,80,000 units per annum. Significantly, it has 95 per cent capacity utilisation with demand rising for its products in the country. In 2003, its had an installed capacity to manufacture about 50,000 units annually. “Our projection is that the existing capacity should be sufficient to take care of the market for the next four-five years,” Graffi said. Interestingly, Piaggio’s powertrain plant, which has an installed capacity to produce about 1,50,000 units annually, is at present operating at 100 per cent capacity utilization. Both plants are flexible in manufacturing. While the vehicle production plant is good enough for another four-five years to meet the market demand, the engine plant is likely to see capacity expansion in the future. “Depending on the market demand, we will expand capacity to produce 1,80,000 engines every year,” Graffi explained. At present, it manufactures LPG, CNG and petrol engines. Interestingly, it also produces a twin-cylinder diesel engine for the Porter 1000 four-wheeled small commercial vehicle. Recently, the company introduced new series of Ape model of three wheelers in CNG and LPG variants for the local market. The launch coincided with the roll out of the 2.5 millionth Piaggio vehicle from its Baramati factory in Maharashtra. The Ape Xtra LDX and Ape Auto DX three-wheeler passenger and cargo vehicle are part of the new industry-first water-cooled engine technology range. The new range of vehicles priced between Rs 1.52 lakh and Rs 1.94 lakh will meet the growing demand for commercial vehicle mobility solutions particularly suited to intra-city travel, Graffi said. He said the company was developing the alternative fuel product portfolio to strengthen its leadership in the cargo segment, which commanded 45 per cent market share. The customer initiatives and improved range of alternate fuel vehicles are a part of the company's strategy to further consolidate and strengthen Piaggio's presence in the small commercial vehicle industry, Graffi said. Piaggio also announced a warranty and insurance program, where customers buying Ape Diesel three wheelers will get a warranty for 42 months or 1.2 lakh kilometres, whichever is earlier. Customers buying the Ape CNG/LPG/petrol three wheelers will be entitled to a warranty of 36 months or 1 lakh kilometres, whichever is earlier. The brand is also offering each new Piaggio customer a personal accident insurance cover of Rs 1 lakh.